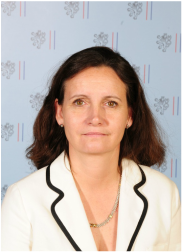 Ambassador Edita Hrda is the Permanent Representative of the Czech Republic to the United Nations. Prior to her appointment, Ms. Hrda held many positions in the Czech Republic’s Ministry for Foreign Affairs, which she joined in 1992. Until assuming her post in New York in 2011, she was Director-General of the Minister’s Section. Prior to that, she was Director-General of the Economic and Cultural Section, Director of the American Department, Director of Multilateral Economic Affairs and Director of Central Europe Department. From 1999 to 2003, she was her country’s Ambassador to Argentina and Paraguay. In the years 1996 to 1998 she was Chief negotiator of the Czech-German post- World War II indemnification, in 2006 and 2007 member of Supervisory Boards of the Export Bank, and Czech Export Guarantee and Insurance Corporation. She studied trade (1982-1986) and management and informatics (1985-1989) at the University of Economics in Prague, completed post-graduate studies in International Relations at the Diplomatic Academy in Madrid (1992). Mrs. Hrda is proficient in German, Spanish, English, Russian and French.